The Kangertech Subtank Mini is a truly revolutionary design from Kanger (KangerTech). The Kangertech Subtank Mini has a 4.5ml capacity, it uses the new Kangertech OCC (Organic Cotton Coil) coils, the Kanger Subtank Mini also features a new airflow control design. The combination of the new design elements of the Kanger Subtank Mini as well as the use of the Japanese Organic Cotton coils provides an excellent vaping experience and the purest flavor for your vaforite eLiquid. Last but not least, the Kanger Subtank Mini comes with a rebuildable atomizer deck (RBA) to use with the Kanger Subtank Mini if you have the time and interest to build your own coil. 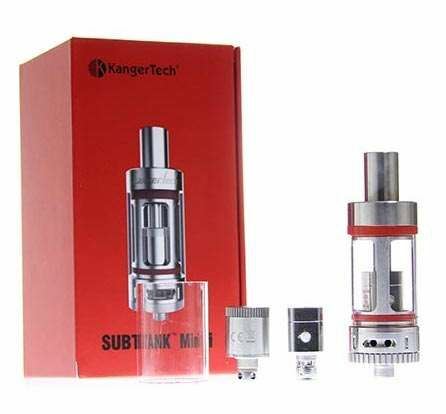 The Kanger Subtank Mini is today the most versatile tank on the market. The Kangertech Subtank Mini Clearomizer is a brand new revolutionary tank from Kangertech. It's smaller than the Aspire Atlantis, yet has a larger liquid capacity of 4.5ml. The Kanger Subtank Mini Clearomizer gives you the ability to switch between the OCC heads or the brand new Mini RBA head. This brand new Kanger Subtank Mini Clearomizer has a 22mm diameter as opposed to the original Subtank which has a 25mm diameter and can only hold about 4.5mL of e-juice. Kanger also includes a Mini RBA which features a new Air Flow Control, and the original Organic Cotton Coil heads. The Kanger Subtank Mini Clearomizer might be small in size but it is still just as powerful and fantastic as its older brother the original Kanger Subtank. - This is the latest version of the Kanger Subtank Mini from Kanger with the RBA section featuring the brown PEEK insulator. - When using the RBA deck - you might need to remove the white O-ring under the RBA deck to make good contact with the pin inside the base. This tip worked well for us. - The Kanger Subtank Mini is a sub ohm tank, as such it should only be used with a battery capable of driving a sub ohm tank safely. All sub ohm batteries sold by us are compatible with this tank. Do not purchase or use this tank if you are not familiar with sub ohm vaping.